The Springs Fire in Ventura County had burned 28,000 acres as of Friday evening, destroying vegetation from the 101 Freeway to Pacific Coast Highway and forcing evacuations in several communities as ground crews continued to battle flames while darkness forced the air attack from the sky. The fire burned about 8,000 acres Thursday night, when containment was at 10 percent. That figure was updated several times throughout Friday, until about 6:30 p.m., when officials said in their last update of the day that nearly 44 square miles had burned. 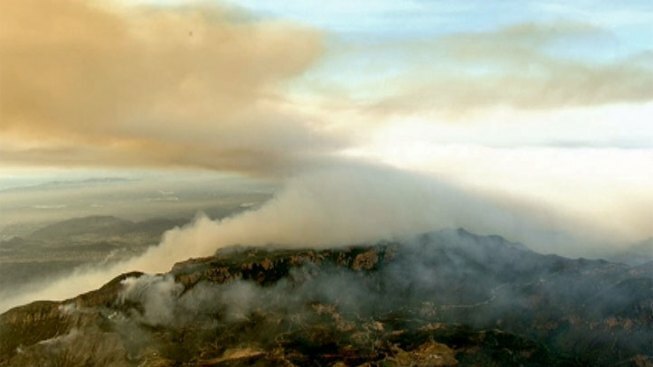 Containment was at 20 percent as sunset came and crews prepared to focus a concentrated attack on the Yerba Buena Road area at the Ventura-Los Angeles county line. The thousand-plus firefighters battling the Springs Fire faced difficult conditions -- winds, high heat, low humidity and the rugged terrain of the Santa Monica Mountains. "It feels ... like you're always behind, " U.S. Forest Service Division Chief Steve Seltzner said. "Just about the time you get caught up, the fire is out-flanking you." Pacific Coast Highway, which had been closed since Thursday evening, was reopened at about 8 p.m., according to Caltrans. California Highway Patrol officers were escorting cars along the nine-mile stretch that had been shut down to assess safety conditions. "The hillside is subject to falling debris and rockslides as there is little vegetation," Caltrans said in a news release. The fire in that area had been knocked down, said Caltrans, adding that trucks would be placed in the area to protect motorists from areas where debris is falling. PCH had been closed between Las Posas Road and Mulholland Drive north of Malibu. Immediate evacuations were ordered at about 1 p.m. for the south side of Potrero Road from Reino Road east to 930 W. Potrero Road, including Hidden Valley Road south, the Ventura County Fire Department said. California State University, Channel Islands, has its evacuation order lifted, the county Sheriff's Office announced just before 4 p.m., after the fire burned through the area on Thursday. The campus had been ordered evacuated overnight, and classes were canceled Friday. The university said it would remain closed and likely not reopen till Sunday evening. Meanwhile, the leading southern edge of the fire was burning into Malibu and had jumped to marshy land on the southern side of PCH late Friday morning. The northern edge was just south of Point Mugu Naval Base Ventura County. Smoke from the fire forced a partial evacuation Friday of Point Mugu base housing. Residents were relocated to the naval mobilization processing site at Point Hueneme. At about noon, aerial units attacked a flare-up that sent a tower of flame and smoke near a house near Point Mugu State Park. Aerial video showed people watching the fire from a rooftop (map) as water-dropping helicopters doused the flames. "We're looking good," said Battalion Chief Fred Burris, of the Ventura County Fire Department. "We believe we're past the major structure threat at this time. "Our major concerns are trying to conserve some of the open space in the Point Mugu State Park and prepare for structure protection down in the PCH area." The areas most threatened Friday are along the Malibu coast area and eastern Ventura County, Burris said. Firefighters set backfires Friday morning in the Big Sycamore Canyon area (map) in an effort to block the fire's march. The fire, which began early Thursday morning near Camarillo Springs, burned south and reached PCH at Sycamore Canyon Road Thursday evening. Evacuations were ordered for the Sycamore Canyon area, located in Point Mugu State Park and home to some of Southern California's only remaining native grasslands, La Jolla Canyon and Broome Ranch. "The firemen have been doing a really great job of keeping it away from the houses," said Newbury Park resident Sara Mallam. "It is kind of scary to see it get so close, but they really seem to know what they're doing." About 4,000 residences were threatened Friday morning. The fire has damaged 15 residences and five commercial properties, but none were destroyed. The fire forced the closure of Pacific Coast Highway Las Posas and Yerba Buena Road and Yerba Buena Road to Deer Creek Road. Strong Santa Ana winds that fueled the fire Thursday decreased overnight, but wind speeds might pick up again Friday during another day of hot and dry conditions. A significant drop in temperatures is not expected until the weekend. Camarillo resident Zeke Jaquez was among the first to call 911 Thursday to report what would later be dubbed the Springs Fire. He was driving from his home to Los Angeles when he saw what he thought was a car on fire off the side of the 101 Freeway. The fire was one of three significant wildfires that broke out Thursday amid red flag conditions -- indicating high fire danger -- in Southern California. About 100 miles to the east in Riverside County, two homes were destroyed, two more were damaged and 11 vehicles were destroyed in a 12-acre fire Thursday that fire officials suspect was started by a discarded cigarette. A 4 1/2-square-mile blaze that destroyed a home burned for a third day in mountains north of Banning.